This stunning box set features the unstoppable Super Mario Bros, immortalized in this beautifully presented collectable silver laser foil box set! Based on the gaming characters from Nintendo, this series features the heroic exploits of two brothers who always find themselves battling the evils that plague their world. As with the Sonic X boxed set collection, Nintendo once again follows their traditional gaming staple formula that successfully translate one medium to another. This series is purely aimed at children with extremely bad and clichéd voices (which suits the genre perfectly) and cheesy storylines that children and fans will simply adore. Both the video and audio quality of this boxed set is exceptional and match that with a professional audio score and you have a DVD made in gaming heaven. 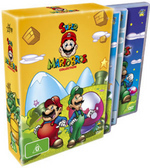 In conclusion, the Super Mario Bros Collection Volume 1 is a must have for parents with kids or fans of the series that simply can't get enough.